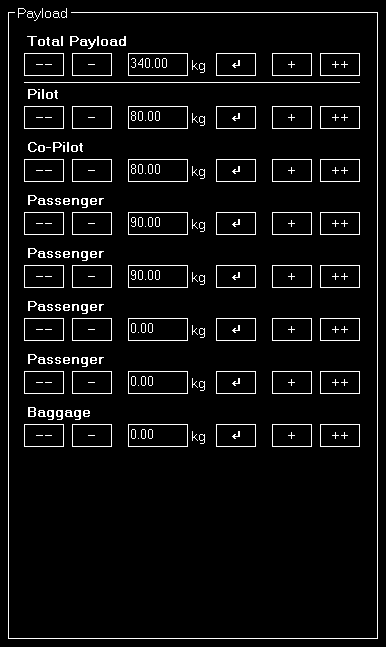 Set the current aircraft fuel amount in all or individual tanks, change the payload of the aircraft and get an overview with automated weight calculation. In first section you can see and adjust the current fuel amount of the aircraft. On top of the list you can see All Tanks which shows the total fuel amount. Below that all individual tanks are listed. You can change the current fuel amount either for all tanks - which leads to your change being equally spread around all tanks - or for one tank individually. Either click on one of the five percent buttons to quickly set a common fuel amount or enter a specific value into the input field. This payload section is designed similar to the fuel section: All payload stations are listed and the load of each payload station can be adjusted by clicking on the appropriate button or entering a specific value manually. 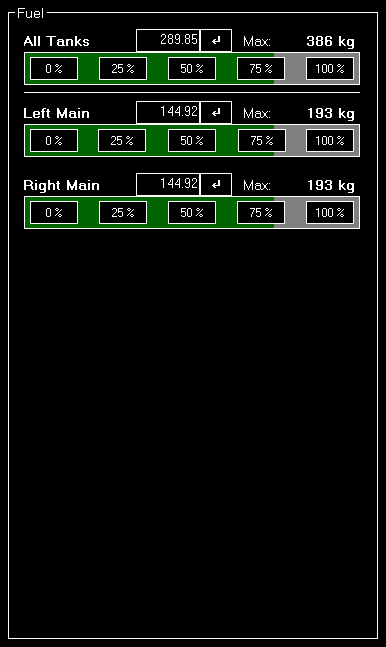 In the weight calculation section the current aircraft weight is calculated in real-time considering the aircraft empty weight, the current payload as well as the remaining fuel in all tanks. Additionally the longitudinal and lateral center of gravity (CG) is displayed here. Note: The lateral center of gravity is not available for X-Plane. Additionally there is an option to freeze the current fuel amount of the aircraft. Then it will not consume fuel anymore as long as this option is set. To unfreeze the fuel again, just click a second time on the button.